As per usual, we have a great cohort in SHIFT-IT Online (online coaching group using my Visual Maps to aid professional and personal shifts). 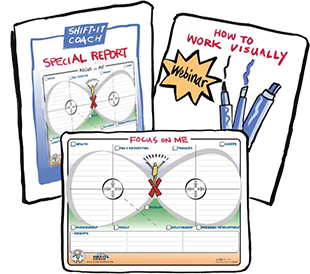 I run this program twice a year and it’s also a pre-requisite for Visual Coach Certification (for coaches, therapists and other helping professionals to work visually with their own clients and use my tools). 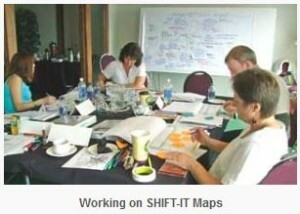 Back in 2002 as a pioneer in Visual Coaching, I started to run SHIFT-IT groups out of my living room in Victoria, British Columbia, Canada and local hotels. 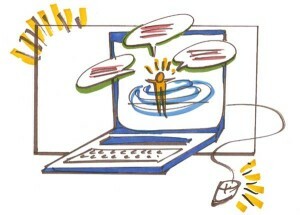 Then I added a tele-conferencing option as most of my clients were in different geographies and didn’t want to travel. We couldn’t see each other, but we could hear each other (and I could direct them how to use my SHIFT-IT Kit while they participated from their home). Flash forward several years and the telephone has been replaced by web conference (you can read about my shift to working visually in a previous post here). Participants use their computers to connect from the comfort of their own homes. I love it as we can actually SEE each other and the visual coaching templates too! Its not in-person (nothing replaces that) but it is a really good alternative. Working this way allows me to hold a good space for folks from across the English-speaking world in which to shift their worlds. And, I get to introduce them to each other, which is wonderful because they co-lead the experience with me as we go along by their sharing. In our current cohort we have North Americans plus participants with German, Dutch and Columbian heritages (you can join us still, dive in, we’d love to have you). Having just completed the Life Maps assignment, we had a fascinating conversation about how the maps FEEL different depending on whether they were written in one’s native language or not. And how the doodles and drawings are a language onto themselves. It appears that for some people, it’s LESS emotional (more removed) when writing in a language that is not one’s primary one. And, it’s MORE emotional (less removed) when writing in one’s native tongue. 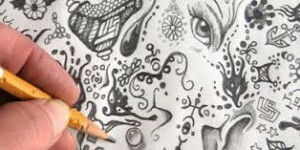 As for the visuals, it depends on the picture you doodle and the colors you use (and the personal meaning you attach to that particular doodle and colors). processing they would like to have (or would be best served by). If my client would like (or is best served) by keeping their interactions with their Life Maps at a higher, more analytical level – then writing in a non-native language would make sense. If my client would (or is best served) by having a deeper and more emotional connection with their story – then writing in their native language would be the way to go. 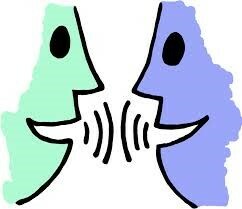 So the multi-lingual folks have more flexibility, than those of us (myself included) who are uni-lingual. And, if a client wants to keep their story in the purely symbolic-for-them realm … they can opt to complete their Life Maps completely in pictures (either images that they find and insert, or ones they draw by hand). There are pros and cons to staying on the surface with your Life Maps versus diving deep with them. For some folks, going deep allows them to see and process things to a greater level than they ever have before. This sets the foundation for really powerful work in the rest of their SHIFT-IT Process. These are usually folks who have a pretty stable past and/or have already done emotional processing on their story (either on their own or with a trained professional) and are in a good position to peel another layer off their onion for enhanced self-awareness. For others, going deep with their Life Maps could be problematic especially if they suffered trauma in their background that has not been processed yet and/or still triggers reactively. I’m a big advocate of therapy and counseling – and aim in my work as The SHIFT-IT Coach to help legitimize going to a good, quality therapist when needed. In fact, we have a few therapists in our Certified Visual Coaches. Sometimes, my private clients also engage a therapist concurrently (one I’ve recommended or one they have or find) to help with the deeper emotional processing while I hold the coaching bits that are appropriate for my role in their SHIFT-IT journey. Even though I just used a ‘talking’ graphic … talking in my opinion should only be part of the approach for skillfully deregulating traumatic backgrounds that are interfering with one’s ability to manifest what one wants in life. The latest research demonstrates that innovative methods that also engage the BODY are most useful, like EMDR, sensorimotor psychotherapy, yoga, and even Improv. I have some sneaking suspicions given the shifts I’ve seen over the years with the SHIFT-IT Visual Coaching Maps that the act of doodling with markers can also qualify somewhat as a body-oriented approach. I’m in the midst of taking a Trauma Studies program overseen by trauma researcher Bessel van der Kolk, M.D. As I’ve mentioned in previous posts, I highly recommend his recently released book, The Body Keeps the Score (really good summary of the body-oriented approaches to trauma). So, in closing, have fun with Visual Life Maps (and other visual maps) and make appropriate-to-you decisions about whether to surface dwell or dive deep. 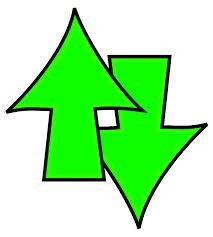 And, seek professional assistance where needed — remember that is a sign of STRENGTH AND MATURITY not weakness! P.S. 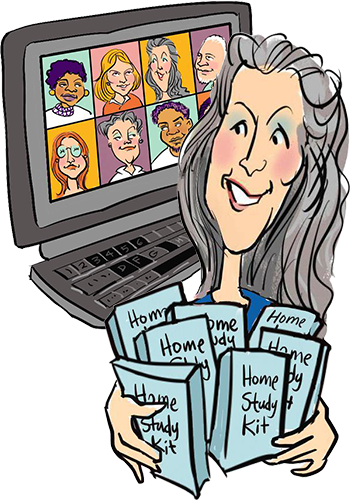 For more information on Life Maps and other Visual Tools to assist in your professional and/or personal shifts see: Private Coaching with Christina Merkley, Visual Coach Directory, SHIFT-IT Online or SHIFT-IT Home Retreat Kit. If you are a coach or therapist curious about learning visual methods to enhance your own practice, see Visual Coach Certification for more info.